Following is a collection of tidbits found or discovered related to Halo 4 fiction, through bulletins, videos, etc. '''Section 3''' is an ongoing Halo community game, of sorts, taking place in community forums, chat, and at times within the game itself. Primarily, it involves a number of AIs and operatives working to locate [[Halo 4 Forerunner Sequences|Forerunner sequences]] which unlock additional Halo lore and game assets. Some operatives are also enemy agents infiltrating the communications, working against community and Section 3. Following is a collection of tidbits found or discovered related to Halo 4 fiction, through bulletins, videos, promotional material, etc. Four of five communications were discovered scattered within Waypoint bulletins leading up to the release of Halo 4, codenamed '''Eleventh Hour'''. These are communications between "Codename Surgeon" and "Codename Coalmine", outlining the state of the Covenant war. Based on the Forerunner character set used on Halo Waypoint, characters have been discovered embedded in various releases. Based on the Forerunner character set used on HaloWaypoint.com "Classified" code entry page, characters have been discovered embedded in various media releases, as well as in-game content. * Sequences are identified by a set of dots and spaces in each piece header. Entering these codes unlocks various Halo universe intel, extra content, and downloadable assets such as avatar awards. 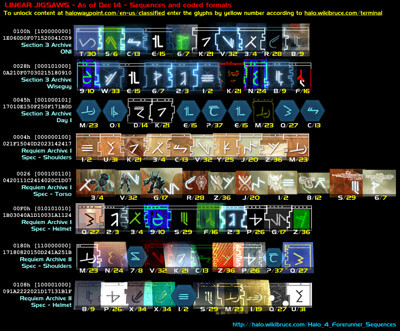 A series of community-released videos are released containing the Didact symbol in natural environments, followed by a number at the very end. Section 3 is an ongoing Halo community game, of sorts, taking place in community forums, chat, and at times within the game itself. Primarily, it involves a number of AIs and operatives working to locate Forerunner sequences which unlock additional Halo lore and game assets. Some operatives are also enemy agents infiltrating the communications, working against community and Section 3. Four of five communications were discovered scattered within Waypoint bulletins leading up to the release of Halo 4, codenamed Eleventh Hour. These are communications between "Codename Surgeon" and "Codename Coalmine", outlining the state of the Covenant war. Sequences are identified by a set of dots and spaces in each piece header. Entering these codes unlocks various Halo universe intel, extra content, and downloadable assets such as avatar awards. This page was last modified on 27 December 2012, at 11:30.